On Friday October 5th, anonymous graffiti artist Banksy created one of the greatest pranks the art world had ever seen. The artist’s painting, Girl with Red Balloon, was rigged with a with a hidden shredder built into the frame. 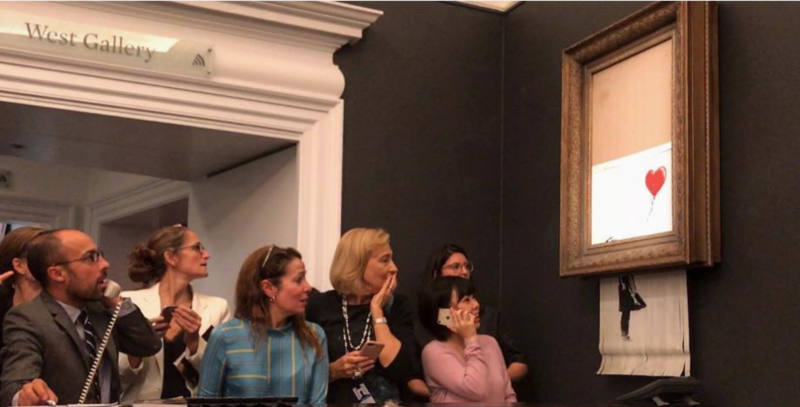 Just moments after the painting was sold at auction for 1.4 million dollars, the shredder activated to the horror of the packed auction house. Banksy is known as a prankster in the professional art world. He simply posted a picture of the stunned reactions and shredded painting with the caption, “Going, Going, Gone….” He posted a video showing the frame’s construction along with the live reaction of the auction the next day. Banksy clearly received the reaction he wanted, furthermore the prank would go viral online. The reactions he has received online have varied from high praise to contempt for ruining a great piece. It seems like this is exactly what Banksy was aiming for. Regardless of the painting being shredded, it is now one of the most notorious stories in the art world. Some even believe that this would add to the value to the painting, while other believe it has no effect. This is a stunt for the ages, and above all Banksy seems pleased with the results of his work.